If you read through Article I, Section VIII, of the Constitution, it says nothing about Congress having the power to subsidize or pay for disaster relief. But I realize very few people care about the Constitution, so I’m going to make a utilitarian argument against Federal Emergency Management Agency (FEMA) and other forms of federal involvement in natural disasters. Best of all, I don’t really need to do any heavy lifting. Someone else already has put together a very strong indictment, using Dauphin Island in Alabama as a case study. Even in the off season, the pastel beach houses lining a skinny strip of sand here are a testament to the good life. They are also a monument to the generosity, and perhaps to the inertia, of the federal government… The western end of this Gulf Coast island has proved to be one of the most hazardous places in the country for waterfront property. Since 1979, nearly a dozen hurricanes and large storms have rolled in and knocked down houses, chewed up sewers and water pipes and hurled sand onto the roads. Yet time and again, checks from Washington have allowed the town to put itself back together. Across the nation, tens of billions of tax dollars have been spent on subsidizing coastal reconstruction in the aftermath of storms, usually with little consideration of whether it actually makes sense to keep rebuilding in disaster-prone areas. If history is any guide, a large fraction of the federal money allotted to New York, New Jersey and other states recovering from Hurricane Sandy — an amount that could exceed $30 billion — will be used the same way. Tax money will go toward putting things back as they were, essentially duplicating the vulnerability laid bare by the hurricane. …Like many other beachfront towns, [Dauphin Island] has benefited from the Stafford Act, a federal law that taps the U.S. Treasury for 75 percent or more of the cost of fixing storm-damaged infrastructure, like roads and utilities. At least $80 million, adjusted for inflation, has gone into patching up this one island since 1979 — more than $60,000 for every permanent resident. That does not include payments of $72 million to homeowners from the highly subsidized federal flood insurance program. Conservatives often complain about welfare programs that pay single mothers to have children out of wedlock. That’s a legitimate complaint since the welfare state has failed both poor people and taxpayers. But they should apply the same analysis and apply even more moral outrage to handouts that encourage rich people to keep rebuilding in disaster-prone areas. And there’s no question that federal handouts and giveaways are a driving force. You also won’t be surprised that one of America’s worst Presidents also has a role in this story. I have just one message for Mayor Collier. I don’t care about your damn clock. Your people should be free to rebuild, but don’t ask me to pay for it. We do have a tiny bit of good news to report, thanks to libertarians and some of their allies. A coalition in Washington called SmarterSafer.org, made up of environmentalists, libertarians and budget watchdogs, contends that the subsidies have essentially become a destructive, unaffordable entitlement. …This argument might be gaining some traction. Earlier this year, Congress passed changes to the federal flood insurance program that are supposed to raise historically low premiums and reduce homeowner incentives for rebuilding in the most hazardous areas. But we need to do more than get rid of federal flood insurance subsidies. Less widely known about than flood insurance are the subsidies from the Stafford Act, the federal law governing the response to emergencies like hurricanes, wildfires and tornadoes. It kicks in when the president declares a federal disaster that exceeds the response capacity of state and local governments. Experts say the law is at least as important as the flood program in motivating reconstruction after storms. In the same way flood insurance shields families from the financial consequences of rebuilding in risky areas, the Stafford Act shields local and state governments from the full implications of their decisions on land use. Under the law, the federal government committed more than $80 billion to disaster recovery from 2004 to 2011, according to a report from the Government Accountability Office. While billions of dollars went to relieve immediate suffering, including cash payments to families left homeless by storms, nearly half of the money was spent helping state and local governments clean and restore damaged areas and rebuild infrastructure. Finally, I can’t resist sharing this one last excerpt from the story. Gee, I’m overjoyed that Mr. Minus has a nice view of dolphins. But it strikes me as very perverse that ordinary taxpayers around America are getting raped so this representative of the top 1 percent can enjoy nice views. 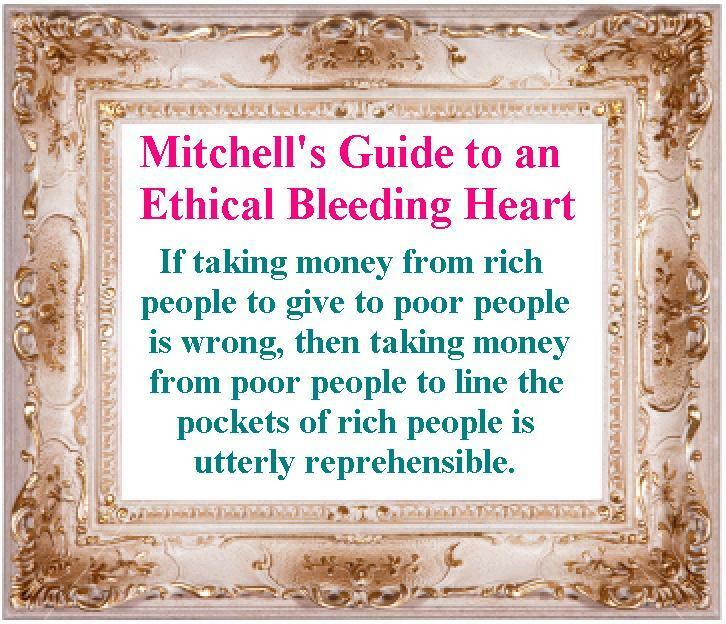 This is obviously a perfect example of where my ethical bleeding heart rule should apply. So what’s the answer? Simple, end the federal government’s role, including getting rid of FEMA. Shikha Dalmia of the Reason Foundation explains why in the Washington Examiner. A New York Times editorial declared that the impending storm proved that the country needs FEMA-style “Big Government” solutions more than ever. Salon, New Republic and other liberal outfits heartily agreed. Why do liberals love FEMA so much? Certainly not for its glorious track record. Rather, FEMA has been a great vehicle for expanding the welfare state. …So how did the new and improved FEMA perform post-Sandy, a storm for which it had lots of advance warning? Not so well. It didn’t set up its first relief center until four days after Sandy hit — only to run out of drinking water on the same day. It couldn’t put sufficient boots on the ground to protect Queens residents from roving looters. The Red Cross — on whom FEMA depends for delivering basic goods — left Staten Island stranded for nearly a week, prompting borough President Jim Molinaro to fume that America was not a Third World country. But FEMA’s most egregious gaffe was that it arranged for 24 million gallons of free gas for Sandy’s victims, but most of them couldn’t lay their hands on it. But if you think FEMA’s inability to provide rapid relief subverts the core reason for its existence, think again. A few days after the Times’ valentine, FEMA head W. Craig Fugate told the newspaper that the agency’s rapid response role is really a fallacy. “The general public assumes we are part of the response team that will be there the first couple of days,” he said. But it is really designed to deal with disasters several days after the fact. How does FEMA do that? By indiscriminately writing checks — a task at which it evidently excels. Yes, we finally find something FEMA does with considerable skill. It can waste money. FEMA administrator Elizabeth Zimmerman testified before Congress last year that between 2005 and 2009, 14.5 percent of the agency’s $10 billion-plus disaster aid budget was handed to people who didn’t qualify. The agency tried to get 154,000 of these people to return the money (on average, each had received about $5,000), but they filed a class action lawsuit forcing FEMA to pay them a multimillion settlement. And it forgave the debt of every one with an income below $90,000. …The bigger problem is not with who gets FEMA money, but why. Less than a sixth of Alabama’s $566 million allotment after Katrina financed legitimate government functions such as debris removal, repairing damaged infrastructure and restoring public utilities. The rest was all handouts: food stamps, subsidies for trailer homes and low-interest loans for small businesses. The FEMA website is already advertising goodies for Sandy victims, including 26 weeks of unemployment benefits and up to $200,000 worth of low-interest loans for home repairs not covered by insurance. In addition, it wants to hand out $2 million loans to small businesses and nonprofits (of all sizes) experiencing “cash flow problems.” Farmers and ranchers could likewise qualify for $500,000 in loans to cover production and property losses. Anyone in Sandy’s path can latch on to the FEMA teat. This is not disaster relief but disaster socialism. It is one thing for the government to provide emergency housing, health care and food; it is quite another to compensate victims for every loss. If people knocked down by a storm deserve such federal largesse, why not open the coffers to anyone who suffers a car crash, a death in the family or a broken heart? Or what if your house burns down? We instinctively know it would be stupid for the government to pay people to rebuild their houses after a fire because then they’ll decide it no longer makes sense to be responsible. So why, then, does it make sense to subsidize irresponsibility on a broader scale? Particularly when it encourages people to make decisions that could place their lives in danger. The bottom line is that the federal government shouldn’t take over roles that are better handled by the private sector (such as market-priced homeowner’s insurance) or state and local government (such as emergency response and infrastructure repair and maintenance). FEMA does more harm than good. It encourages passivity on the part of both people in the private sector and state and local government officials. It’s damaging to the national character when people learn an entitlement mentality and sit around waiting for the federal government to give them freebies. And how can anyone forget the spectacular incompetence of Louisiana Governor Kathleen Blanco and New Orleans Mayor Ray Nagin during and after Katrina in 2005. Both of them seemed to think it was appropriate to curl up in fetal positions and let Uncle Sam do their jobs. P.S. I can think of two exceptions to the notion that there should be no federal involvement in disaster relief. First, Washington has a legitimate role in disasters resulting from foreign attack. So some sort of involvement after the 9-11 attacks was appropriate. Second, even a curmudgeon like me wouldn’t get bent out of shape about short-run emergency response. FEMA obviously doesn’t do that, so I’m thinking hypothetically. Perhaps if a hurricane hit a community and a nearby military base had heavy equipment that could help with the immediate clean-up. As soon as the federal government takes its hand out of the citizens pockets, they won’t expect socialist benefits. Unfortunately, America has a socialist mentality. Unfortunately a vast majority of adults suffer from some sort of psychological disorder that implants government in place of the Santa Claus they lost as a child. The disorder is called, being a complete idiot. I do not know about you guys but our government is doing nothing for us. This is suppose to be WE THE PEOPLE. NOT THEM PEOPLE we are letting a few make our choices what is best for us When it is what’s best for them. My God we have let them put us close to 18 trillion dollars in the red. In case you don’t comprehend the magnitude of 18 trillion i will give you a example.If you started counting to one trillion and if you lived as long as it takes to count to one trillion you would be 31 thousand years old when you got done with the first trillion it is unbelieveable HOW MANY DOLLARS IN DEBT WE ARE they own up to 18 trillion but who knows how much. And what in the hell did they spend it on who get to overdraft 18 trillion i think a third of our debt is interest alone my God, if you don’t think this thing is not going to blow would you please wake up and look around you. This is what everyone should be focusing on. And no the government SHOULDN’T HAVE ANYTHING TO DO WITH ANYTHING OUTER THAN WHAT WE THE PEOPLE TELL IT TO DO. damage upon louis vuitton sac using what ever means available. Indeed, it is highly resistant to surface scratches. Dan, if you read the clause of Article VII of the Constitution carefully and think logically about it, a difficult question should arise. How could Article VII ever have stated the law about “Establishment” prior to the establishment of the proposed constitution of which Article VII is merely one part? EKC, perhaps FEMA’s masters want to kill, or nearly to kill, the market for flood insurance. To do so would be consistent with their great desire for a caring, overbearing, parentlike government and with their desire to criminalize independence and self-defense. So let’s see if we can’t figure out what their clever plan might be. First they undermine private initiative to obtain insurance sufficient to cover losses that homeowners are unwilling to bear. Soon the demand for flood insurance withers. Some businesspeople reduce coverage in their offerings and others refrain from writing new policies altogether. Later, the cry “Market failure!” rings out. So do demands for even more intervention by FEMA and other agencies. Little time passes before a few political hacks organize community meetings to raise awareness about what new actions government might take in response to the problem. Leftwing and fascistic politicians already in office just happen to be invited. They arrive as scheduled and make a few remarks to the crowd of children who are eager to be cared for thoroughly by their government. During the Q & A session some fool in the audience proclaims that this is definitely a case in which the federal government should take over roles that are handled poorly by the private sector. Hundreds of heads nod vigorously in agreement. The younger ringleaders simper at each other. A new bill hundreds of pages long is introduced to the legislature within just a few days. Now, could it be that markets for roads, water delivery, and septic systems, too, are an inspiration to the people who want to kill private flood insurance? It would be unsurprising to discover that the answer is yes. Nevertheless, people like Ayn Rand and Dan Mitchell, known collectivists and obstinate tax ideologues, rarely fail to ignore the lesson that they should have learned long before middle age. It’s difficult not to suspect that they are useful court intellectuals in the long war to enslave the world to government. Of course, the leftists and the fascists may win their little war, and if so, they may decide that they have no more use for right wing court intellectuals, who rationalize the foundation relied upon by leftwing and fascistic despots. I spoke with some of the residents of Manhattan Beach about 2 weeks while my wife and I were bringing supplies to her family and I witnessed the irresponsibility that FEMA encourages. The FEMA officials were telling residents in the area that each household would receive a payment in the range of $20,000-$30,000 to aid in repairs even though private flood insurance options were available to the residents before the storm! Why would anyone be responsible and purchase flood insurance if they know that FEMA is going to be there to pick up the bill after a disaster?